The key problem in knowledge acquisition algorithm is how to deal with large-scale datasets and extract small number of compact rules. In recent years, several approaches to distributed data mining have been developed, but only a few of them benefit rough set based knowledge acquisition methods. 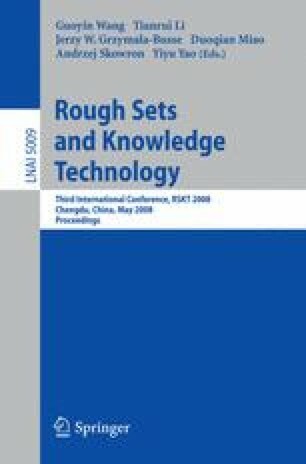 This paper is intended to combine multi-agent technology into rough set based knowledge acquisition method. We briefly review the multi-knowledge acquisition algorithm, and propose a novel approach of distributed multi-knowledge acquisition method. Information system is decomposed into sub-systems by independent partition attribute set. Agent based knowledge acquisition tasks depend on universes of sub-systems, and the agent-oriented implementation is discussed. The main advantage of the method is that it is efficient on large-scale datasets and avoids generating excessive rules. Finally, the capabilities of our method are demonstrated on several datasets and results show that rules acquired are compact, having classification accuracy comparable to state-of-the-art methods.